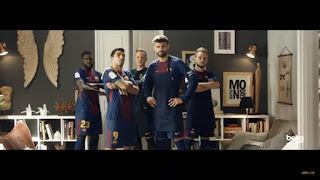 Well if it takes a village to raise a child as the proverb goes then it takes a whole football team (FC Barcelona to be specific) to make a child eat his vegetables with Beko appliances as a back up. But worry not - it all goes down like a charm with all the enticing elements added to the recipe! Watch the full video here and amaze to the final result. Apparently this is not a FIFA World Cup ad but then again this is football seasons so it all goes!